I think that the event(interrupt?) driven mailboxes are really neat to do a pipelining process between cogs. In opposite to the P1 the P2 has some special mailboxes, able to execute a interrupt (one each cog? not sure). Else a HUB read or write of a long is atomic, no need for semaphores. Same for P1 and P2. Locks are just needed if more then one long need to get changed in a atomic way. Then you will need some lock/semaphore mechanism to ensure data integrity with multiple cogs. And maybe the still upcoming smart pins have some interesting fast data links between cogs on one or more props without hub access. Just share a smart pin. using cordic to rotate a point. "Rotate (X32,Y32) by Theta32 → (X32,Y32)"
This makes it look like the syntax should be QROTATE D/S/theta. In the old calls to the cordic there was a setqx and setqy... do we set theta now? When we say "X32"... is decimal notation implied? When we specify the angle... is the part 1/2^32 or are we using some decimation here? Have you tried SETQ theta, QROTATE x, y (or y, x)? I thought that was what SETQ was originally intended for before it also became used for block hub transfers? I don't think it makes any difference if you think of X32 as referring to an integer or a fixed-point number. You should be able to put your decimal (or binary) point wherever you want. For theta, I would guess that 2^32-1 = 360 degrees. Thank you! Have the rugrat right now so it is a matter of who sleeps first. As usual I cannot see the obvious. I am trying to do something very simple... copy the contents of cog ram into lut ram. You want # or ## since you want to give it an immediate source value, and you don't need ## since all cogram addresses fit in 9 bits. You don't want @ since you want a cogram address and not a hubram address. Therefore, I would think wrlut #0, #0 should copy all of cogram into lutram. What does ### mean? I've never seen it before. I was trying to do it with a djns loop not with rep ... makes perfect sense though. as I recall Chip used just 0 for the source... so maybe just 0,0. I'll try it. No # or @ is involved here. While I was stumbling around in the fog, I came close to an epiphany... or an epiphora. Pretty foggy; hard to tell. I have a routine, which runs in its own cog. The entire code is less than 200 lines, including variables. There are about 25 constants. The routine ends with a "fit $1F0" statement. Everything was going along fine until I added a very simple statement, which couldn't blow anything up... and then everything blew up. I spent a couple of days looking at my logic and eventually refined it so that it used fewer instructions and variables and then everything was ok again. I am left with the impression that even though the code is short and I don't get any warnings about space, somehow, my cog's usable programming space is being impacted by the variable space being used by other cogs... is this true? Or is there a limit on the total code size of a .spin file? cmp start_analysis,#1 wz                    'watch byte at hub memory address ##1000008 wait until contain value "1". mov var1,#30                        'parameter 1, tolerance of pixel differnce to establish "goodness"
This is first step in a stereo-ranging application. It was working as expected for a single point. and then blew up when I tried to add loops to index the x and y of the target point. The issue is size... isn't that always the way? Can you attach the actual spin file you're using? I tried assembling the code that you had included in your second last post and it has problems. First I had to add a DAT statement to get it to assemble, and then it complained that cogcom is undefined. sorry... have a flu, been sleeping. To see it in all its glory... you have to adjust the baud rate and then send the ascii equivalent of zero. This is working as it should for me. I don't have the series of tries that didn't work... but add in a few variables and some nothing code and see what happens:) It expects the bmp file in the same folder. This version is in a continuous loop... so even though it doesn't look like it, it does the same thing ... over and over and over. This interfaces to my P2Explorer program so that I can send it a continuous stream of stereo-images from a Bloggie 3D camera... for testing, etc. This is bare-bones... region based, difference testing with no logic added in... except to exclude targets that equally match to more than one stereo point. I very much dislike this kind of stereo matching... but it is fast. And it might be enough for some kinds of applications. Matches are indicated by white dots on the matched points. Looking at a single line, right down the center of the left image trying to match every other point (top to bottom) the way down the line. One obvious problem is that cogcom is defined in one cog, but it is used in two different cogs. The cog that did not define cogcom will be writing in a location defined by the other cog, which most likely contains another variable or instruction. You should use another variable name, such as cogcom1 for the other cog. You should make sure that you don't have any other variable conflicts that could be causing a problem. by golly... I think that might have been the issue. Am going to play with it some more today. I finally have an OV9655 camera working. Straight out of the box, no I2C stuff yet. I'm driving it with a 75.000001 MHz NCO:) If my memory serves me correctly, the OV9655 divides the input frequency by two giving an effective capture of pixels with a pixel clock of 37.5MHz. Pretty darned snazzy!!! The only thing is I wanted proof. So, I wrote a little program to find out. This works fine for verifying the frequency of my generated clock, but when I put the camera in the mix my acquisition stops... because now the pclk is now a smart pin rather than a standard input. Can two different cogs watch for edges on the same standard input pin? In cases as above, I feel pretty stupid putting a waitct1 in there... how can I tell that the smart pin is done doing what I asked it to do... which in this case is to count positive edges for 80_000_000 clocks. couple of typos in there... tonight my browser won't let me edit? The edit button only works arbitrarily via scripting. It's missing its fall-back, one of those little hangovers of the new forums. sorry to bump a thread, Anybody have any pre-eliminary pdfs on instruction set or theory of operation? Can't wait for the first experimenters board with "learning the prop 2" book or some title. 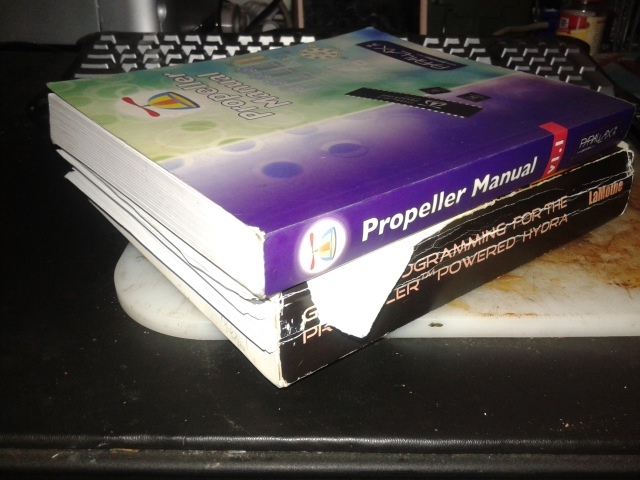 I owe everything I know about micro's to these forums, prop manual and Lamothe's Hydra manual, which first half go really worn out from reading over and over. I suppose it would have a long section on "How it came to be" with direct quotes from the forums on why changes were made to prop 2. How the Propeller II came to be. The two document links at http://forums.parallax.com/discussion/162298/prop2-fpga-files/p1 have the most details. 1. I don't want to give Ken an ulcer. 2. The answer to my question would probably be obvious if I knew a little more about micro-electronics. 3. I seriously doubt that I am the first one to wonder about this, but I haven't seen it talked about. 4. There are so many ways to get things done with the Prop2 that adding very much more would seem to be adding guild to a lily. We can't use a pin as both a smart pin and as a stupid pin at the same time. Analysis of any particular signal might take more than one kind of measurement. Jumping back an forth between logics can become an issue in time sensitive analyses. why can't Chip tap the input to each pin to provide an additional input line from each pin to each cog? I can't wait for Spin2... but then I'm wondering, do I really need it? ... or is there something I just don't understand about PNUT? 1. Does PNUT have any compiler options that are useful from the command line? 2. Here is one of my issues... I'm trying to build a PASM project basically to keep track of useful code snippets. It has gotten so large that it is practically useless to anyone but myself, and so I now find myself stripping out the good bits when I want to communicate or ask a question... assbackwards of my original intent. So... 2b. is it possible to have PNUT load code from various .spin files or do they have to be compiled first? Does anyone have an example? You could use the 'file' directive in PASM to load pre-assembled data, but you would have to make something to extract data post-assember from the .obj file that PNut outputs. Once we get some higher-level language support, what you want will be simple and automatic. For now, we have just enough tool to test the design. Didn't Dave Hein write an assembler for P2 that he was using with his P2 C compiler project?